Incorporating centuries of nostalgia with vintage floral patterns, the Rose Collection of fine bone china by Newbridge Home is a truly unique collection. Add a touch of elegance to your table setting with this opulent butter dish creating the perfect ambience for afternoon tea making any occasion the ultimate luxurious experience. As a gift for yourself or someone else, it conveys an air of timelessness and levity. 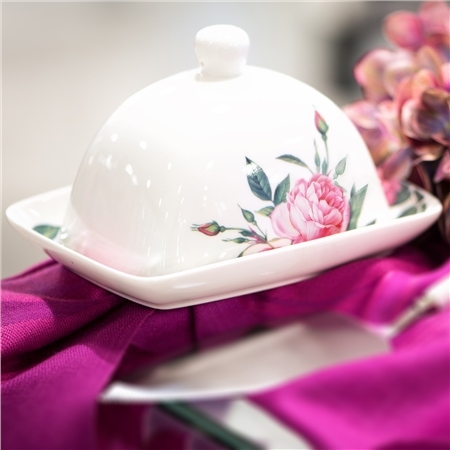 fine bone china rose detail butter dish presented in a Newbridge Silverware gift box.